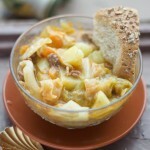 Here is a recipe for simple, tasty cabbage stew. Here is a great video on pressure cookers, and I’m taking the liberty of summarizing it to explain how it all works. The basic pressure cooker consists of a pot, a perfectly fitting lid, a rubber ring in between the pot and lid, and a valve with a release whistle on the lid. The rubber ring serves to seal the pot and lid so no air escapes. The valve ensures that if the pressure is too high, some of the steam is released out. As a whole, when heated, this mechanism creates pressure and steam. The first pressure cooker was invented more than 400 years ago, but it wasn’t until last century that their popularity surged. It was then that the pressure cooker was perfected as far as the safety. I’m sure that’s your first worry when thinking about using a pressure cooker. It was for me too. However if you read the instructions and watch a couple of videos you should be well prepared to use one. Or ask an experienced pressure cooker user to show you the basics before you go at it alone. Some general things to know when cooking anything in a pressure cooker: DON’T fill your pressure cooker more than 2/3 with food or 1/2 with liquid; DO brown your meat before putting in pressure cooker for more flavor; DON’T use thickeners until after the meal has cooked; DO always, always, always release the pressure before opening the lid to prevent explosions. 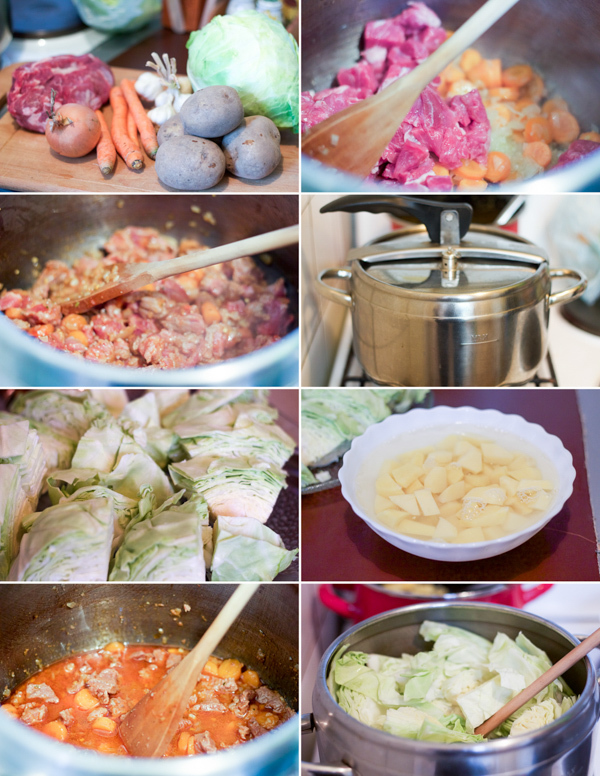 Now here are a couple of tips for this cabbage stew that you can use when cooking other things too. 1. Use old potatoes for any type of stews, pies, hash brown pies, stuffed peppers, or mashed potatoes. Young and baby potatoes are great for baking in the oven. 2. 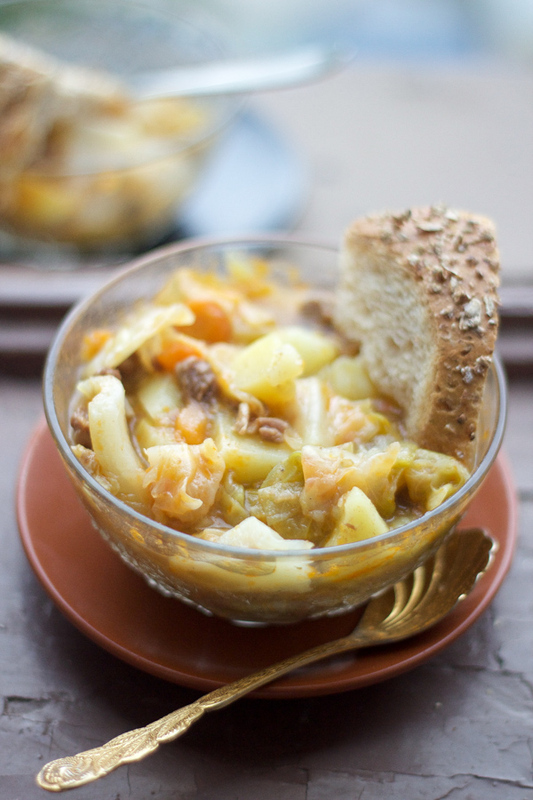 Green cabbage is the one you want to use for this stew as red cabbage is best for salads. 3. Any type of soft meat will work, such as veal, or if you are going for an older cut, look for sirloin. Good luck, and if you decided to give pressure cooker a try let me know how you did! Dice the onion, carrots, garlic, and veal. Add oil and brown all in pressure cooker (lid off) on stovetop on medium high. You can do it all at the same time, or simmer each ingredient as you are dicing. Simmer for about 15-20 minutes, then add paprika, salt, pepper, and about 3 cups of water (watch for the maximum capacity in pressure cooker though). Discard outer cabbage leaves, and wash the cabbage head well. Cut into quarters lengthwise, then cut out the root (and discard it). Cut the remaining quarters into four-six pieces each. Peel the potatoes and dice. Add all to the pressure cooker and close the lid. After about 15-20 minutes, remove from heat, let all the steam out, and only after it’s all gone you can take off the lid. Cut up parsley finely and add. Serve with bread. 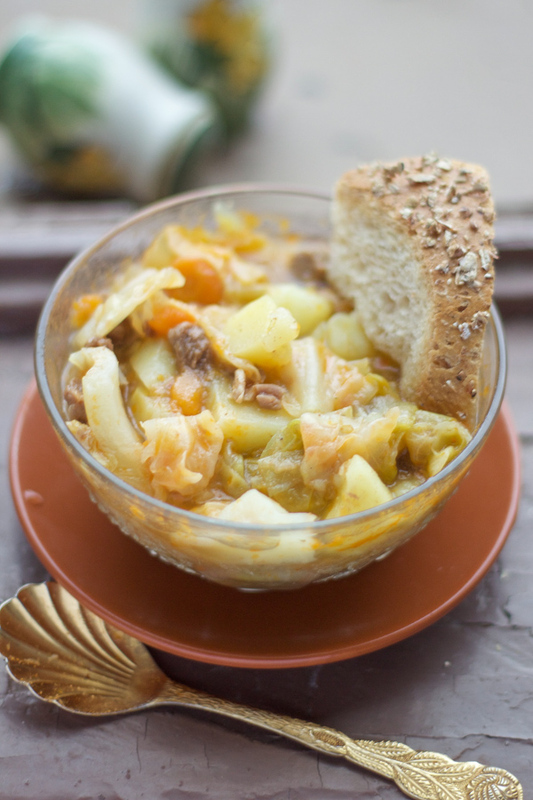 This stew asks for green cabbage. You can use sirloin instead of veal. What you are looking for is soft, succulent meat. Since all pressure cookers are different, your cooking time may vary. Some readers reported they needed less time after adding the cabbage (10 min). 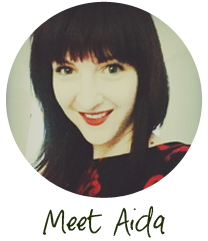 I did try the pressure cooker – an Instant Pot. I did 20 minutes on high pressure; way too long. Almost turned the cabbage to jelly. I would do 13 minutes next time on high. I also used Italian Turkey Sausage. It was still delicious. Thanks. Thanks for letting me know. I made a note in the recipe. Every pressure cooker is different so this may help other readers who have one that’s similar to yours.